Liczba stron: 616 Jest to ujednolicona liczba stron, która ułatwi Ci porównanie długości książek. Każda strona Legimi to 200 słów. “As I ponder'd in silence, Returning upon my poems, considering, lingering long, A Phantom arose before me with distrustful aspect, Terrible in beauty, age, and power, The genius of poets of old lands, As to me directing like flame its eyes, With finger pointing to many immortal songs, And menacing voice, What singest thou? it said, Know'st thou not there is but one theme for ever-enduring bards? And that is the theme of War, the fortune of battles, The making of perfect soldiers.” “Leaves of Grass” is a poetry collection by the American poet Walt Whitman (1819–1892). 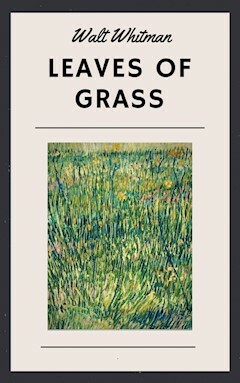 The poems of “Leaves of Grass” are loosely connected, with each representing Whitman's celebration of his philosophy of life and humanity. Walt Whitman is among the most influential poets in the American canon, often called the father of free verse. With Husky-Haughty Lips, O Sea! "The Rounded Catalogue Divine Complete"
One's-self I sing, a simple separate person, Yet utter the word Democratic, the word En-Masse. Of physiology from top to toe I sing, Not physiognomy alone nor brain alone is worthy for the Muse, I say the Form complete is worthier far, The Female equally with the Male I sing. Of Life immense in passion, pulse, and power, Cheerful, for freest action form'd under the laws divine, The Modern Man I sing. As I ponder'd in silence, Returning upon my poems, considering, lingering long, A Phantom arose before me with distrustful aspect, Terrible in beauty, age, and power, The genius of poets of old lands, As to me directing like flame its eyes, With finger pointing to many immortal songs, And menacing voice, What singest thou? it said, Know'st thou not there is but one theme for ever-enduring bards? And that is the theme of War, the fortune of battles, The making of perfect soldiers. Be it so, then I answer'd, I too haughty Shade also sing war, and a longer and greater one than any, Waged in my book with varying fortune, with flight, advance and retreat, victory deferr'd and wavering, (Yet methinks certain, or as good as certain, at the last,) the field the world, For life and death, for the Body and for the eternal Soul, Lo, I too am come, chanting the chant of battles, I above all promote brave soldiers. In cabin'd ships at sea, The boundless blue on every side expanding, With whistling winds and music of the waves, the large imperious waves, Or some lone bark buoy'd on the dense marine, Where joyous full of faith, spreading white sails, She cleaves the ether mid the sparkle and the foam of day, or under many a star at night, By sailors young and old haply will I, a reminiscence of the land, be read, In full rapport at last. Here are our thoughts, voyagers' thoughts, Here not the land, firm land, alone appears, may then by them be said, The sky o'erarches here, we feel the undulating deck beneath our feet, We feel the long pulsation, ebb and flow of endless motion, The tones of unseen mystery, the vague and vast suggestions of the briny world, the liquid-flowing syllables, The perfume, the faint creaking of the cordage, the melancholy rhythm, The boundless vista and the horizon far and dim are all here, And this is ocean's poem. Then falter not O book, fulfil your destiny, You not a reminiscence of the land alone, You too as a lone bark cleaving the ether, purpos'd I know not whither, yet ever full of faith, Consort to every ship that sails, sail you! Bear forth to them folded my love, (dear mariners, for you I fold it here in every leaf;) Speed on my book! spread your white sails my little bark athwart the imperious waves, Chant on, sail on, bear o'er the boundless blue from me to every sea, This song for mariners and all their ships. I heard that you ask'd for something to prove this puzzle the New World, And to define America, her athletic Democracy, Therefore I send you my poems that you behold in them what you wanted. To thee old cause! Thou peerless, passionate, good cause, Thou stern, remorseless, sweet idea, Deathless throughout the ages, races, lands, After a strange sad war, great war for thee, (I think all war through time was really fought, and ever will be really fought, for thee,) These chants for thee, the eternal march of thee. (A war O soldiers not for itself alone, Far, far more stood silently waiting behind, now to advance in this book.) Thou orb of many orbs! Thou seething principle! thou well-kept, latent germ! thou centre! Around the idea of thee the war revolving, With all its angry and vehement play of causes, (With vast results to come for thrice a thousand years,) These recitatives for thee,—my book and the war are one, Merged in its spirit I and mine, as the contest hinged on thee, As a wheel on its axis turns, this book unwitting to itself, Around the idea of thee. For him I sing, I raise the present on the past, (As some perennial tree out of its roots, the present on the past,) With time and space I him dilate and fuse the immortal laws, To make himself by them the law unto himself. Beginning my studies the first step pleas'd me so much, The mere fact consciousness, these forms, the power of motion, The least insect or animal, the senses, eyesight, love, The first step I say awed me and pleas'd me so much, I have hardly gone and hardly wish'd to go any farther, But stop and loiter all the time to sing it in ecstatic songs. On journeys through the States we start, (Ay through the world, urged by these songs, Sailing henceforth to every land, to every sea,) We willing learners of all, teachers of all, and lovers of all. We have watch'd the seasons dispensing themselves and passing on, And have said, Why should not a man or woman do as much as the seasons, and effuse as much? We dwell a while in every city and town, We pass through Kanada, the North-east, the vast valley of the Mississippi, and the Southern States, We confer on equal terms with each of the States, We make trial of ourselves and invite men and women to hear, We say to ourselves, Remember, fear not, be candid, promulge the body and the soul, Dwell a while and pass on, be copious, temperate, chaste, magnetic, And what you effuse may then return as the seasons return, And may be just as much as the seasons. Here, take this gift, I was reserving it for some hero, speaker, or general, One who should serve the good old cause, the great idea, the progress and freedom of the race, Some brave confronter of despots, some daring rebel; But I see that what I was reserving belongs to you just as much as to any. Me imperturbe, standing at ease in Nature, Master of all or mistress of all, aplomb in the midst of irrational things, Imbued as they, passive, receptive, silent as they, Finding my occupation, poverty, notoriety, foibles, crimes, less important than I thought, Me toward the Mexican sea, or in the Mannahatta or the Tennessee, or far north or inland, A river man, or a man of the woods or of any farm-life of these States or of the coast, or the lakes or Kanada, Me wherever my life is lived, O to be self-balanced for contingencies, To confront night, storms, hunger, ridicule, accidents, rebuffs, as the trees and animals do. Thither as I look I see each result and glory retracing itself and nestling close, always obligated, Thither hours, months, years—thither trades, compacts, establishments, even the most minute, Thither every-day life, speech, utensils, politics, persons, estates; Thither we also, I with my leaves and songs, trustful, admirant, As a father to his father going takes his children along with him. What place is besieged, and vainly tries to raise the siege? Lo, I send to that place a commander, swift, brave, immortal, And with him horse and foot, and parks of artillery, And artillery-men, the deadliest that ever fired gun. Shut not your doors to me proud libraries, For that which was lacking on all your well-fill'd shelves, yet needed most, I bring, Forth from the war emerging, a book I have made, The words of my book nothing, the drift of it every thing, A book separate, not link'd with the rest nor felt by the intellect, But you ye untold latencies will thrill to every page. Poets to come! orators, singers, musicians to come! Not to-day is to justify me and answer what I am for, But you, a new brood, native, athletic, continental, greater than before known, Arouse! for you must justify me. I myself but write one or two indicative words for the future, I but advance a moment only to wheel and hurry back in the darkness. I am a man who, sauntering along without fully stopping, turns a casual look upon you and then averts his face, Leaving it to you to prove and define it, Expecting the main things from you. Stranger, if you passing meet me and desire to speak to me, why should you not speak to me? And why should I not speak to you? Thou reader throbbest life and pride and love the same as I, Therefore for thee the following chants. 1 Starting from fish-shape Paumanok where I was born, Well-begotten, and rais'd by a perfect mother, After roaming many lands, lover of populous pavements, Dweller in Mannahatta my city, or on southern savannas, Or a soldier camp'd or carrying my knapsack and gun, or a miner in California, Or rude in my home in Dakota's woods, my diet meat, my drink from the spring, Or withdrawn to muse and meditate in some deep recess, Far from the clank of crowds intervals passing rapt and happy, Aware of the fresh free giver the flowing Missouri, aware of mighty Niagara, Aware of the buffalo herds grazing the plains, the hirsute and strong-breasted bull, Of earth, rocks, Fifth-month flowers experienced, stars, rain, snow, my amaze, Having studied the mocking-bird's tones and the flight of the mountain-hawk, And heard at dawn the unrivall'd one, the hermit thrush from the swamp-cedars, Solitary, singing in the West, I strike up for a New World. 2 Victory, union, faith, identity, time, The indissoluble compacts, riches, mystery, Eternal progress, the kosmos, and the modern reports. This then is life, Here is what has come to the surface after so many throes and convulsions. How curious! how real! Underfoot the divine soil, overhead the sun. See revolving the globe, The ancestor-continents away group'd together, The present and future continents north and south, with the isthmus between. See, vast trackless spaces, As in a dream they change, they swiftly fill, Countless masses debouch upon them, They are now cover'd with the foremost people, arts, institutions, known. See, projected through time, For me an audience interminable. With firm and regular step they wend, they never stop, Successions of men, Americanos, a hundred millions, One generation playing its part and passing on, Another generation playing its part and passing on in its turn, With faces turn'd sideways or backward towards me to listen, With eyes retrospective towards me. 3 Americanos! conquerors! marches humanitarian! Foremost! century marches! Libertad! masses! For you a programme of chants. Chants of the prairies, Chants of the long-running Mississippi, and down to the Mexican sea, Chants of Ohio, Indiana, Illinois, Iowa, Wisconsin and Minnesota, Chants going forth from the centre from Kansas, and thence equidistant, Shooting in pulses of fire ceaseless to vivify all. 4 Take my leaves America, take them South and take them North, Make welcome for them everywhere, for they are your own off-spring, Surround them East and West, for they would surround you, And you precedents, connect lovingly with them, for they connect lovingly with you. I conn'd old times, I sat studying at the feet of the great masters, Now if eligible O that the great masters might return and study me. In the name of these States shall I scorn the antique? Why these are the children of the antique to justify it. 5 Dead poets, philosophs, priests, Martyrs, artists, inventors, governments long since, Language-shapers on other shores, Nations once powerful, now reduced, withdrawn, or desolate, I dare not proceed till I respectfully credit what you have left wafted hither, I have perused it, own it is admirable, (moving awhile among it,) Think nothing can ever be greater, nothing can ever deserve more than it deserves, Regarding it all intently a long while, then dismissing it, I stand in my place with my own day here. Here lands female and male, Here the heir-ship and heiress-ship of the world, here the flame of materials, Here spirituality the translatress, the openly-avow'd, The ever-tending, the finale of visible forms, The satisfier, after due long-waiting now advancing, Yes here comes my mistress the soul. 6 The soul, Forever and forever—longer than soil is brown and solid—longer than water ebbs and flows. I will make the poems of materials, for I think they are to be the most spiritual poems, And I will make the poems of my body and of mortality, For I think I shall then supply myself with the poems of my soul and of immortality. I will make a song for these States that no one State may under any circumstances be subjected to another State, And I will make a song that there shall be comity by day and by night between all the States, and between any two of them, And I will make a song for the ears of the President, full of weapons with menacing points, And behind the weapons countless dissatisfied faces; And a song make I of the One form'd out of all, The fang'd and glittering One whose head is over all, Resolute warlike One including and over all, (However high the head of any else that head is over all.) I will acknowledge contemporary lands, I will trail the whole geography of the globe and salute courteously every city large and small, And employments! I will put in my poems that with you is heroism upon land and sea, And I will report all heroism from an American point of view. I will sing the song of companionship, I will show what alone must finally compact these, I believe these are to found their own ideal of manly love, indicating it in me, I will therefore let flame from me the burning fires that were threatening to consume me, I will lift what has too long kept down those smouldering fires, I will give them complete abandonment, I will write the evangel-poem of comrades and of love, For who but I should understand love with all its sorrow and joy? And who but I should be the poet of comrades? 7 I am the credulous man of qualities, ages, races, I advance from the people in their own spirit, Here is what sings unrestricted faith. Omnes! omnes! let others ignore what they may, I make the poem of evil also, I commemorate that part also, I am myself just as much evil as good, and my nation is—and I say there is in fact no evil, (Or if there is I say it is just as important to you, to the land or to me, as any thing else.) I too, following many and follow'd by many, inaugurate a religion, I descend into the arena, (It may be I am destin'd to utter the loudest cries there, the winner's pealing shouts, Who knows? they may rise from me yet, and soar above every thing.) Each is not for its own sake, I say the whole earth and all the stars in the sky are for religion's sake. I say no man has ever yet been half devout enough, None has ever yet adored or worship'd half enough, None has begun to think how divine he himself is, and how certain the future is. I say that the real and permanent grandeur of these States must be their religion, Otherwise there is just no real and permanent grandeur; (Nor character nor life worthy the name without religion, Nor land nor man or woman without religion.) 8 What are you doing young man? Are you so earnest, so given up to literature, science, art, amours? These ostensible realities, politics, points? Your ambition or business whatever it may be? It is well—against such I say not a word, I am their poet also, But behold! such swiftly subside, burnt up for religion's sake, For not all matter is fuel to heat, impalpable flame, the essential life of the earth, Any more than such are to religion. 9 What do you seek so pensive and silent? What do you need camerado? Dear son do you think it is love? Listen dear son—listen America, daughter or son, It is a painful thing to love a man or woman to excess, and yet it satisfies, it is great, But there is something else very great, it makes the whole coincide, It, magnificent, beyond materials, with continuous hands sweeps and provides for all. 10 Know you, solely to drop in the earth the germs of a greater religion, The following chants each for its kind I sing. My comrade! For you to share with me two greatnesses, and a third one rising inclusive and more resplendent, The greatness of Love and Democracy, and the greatness of Religion. Melange mine own, the unseen and the seen, Mysterious ocean where the streams empty, Prophetic spirit of materials shifting and flickering around me, Living beings, identities now doubtless near us in the air that we know not of, Contact daily and hourly that will not release me, These selecting, these in hints demanded of me. Not he with a daily kiss onward from childhood kissing me, Has winded and twisted around me that which holds me to him, Any more than I am held to the heavens and all the spiritual world, After what they have done to me, suggesting themes. O such themes—equalities! O divine average! Warblings under the sun, usher'd as now, or at noon, or setting, Strains musical flowing through ages, now reaching hither, I take to your reckless and composite chords, add to them, and cheerfully pass them forward. 11 As I have walk'd in Alabama my morning walk, I have seen where the she-bird the mocking-bird sat on her nest in the briers hatching her brood. I have seen the he-bird also, I have paus'd to hear him near at hand inflating his throat and joyfully singing. And while I paus'd it came to me that what he really sang for was not there only, Nor for his mate nor himself only, nor all sent back by the echoes, But subtle, clandestine, away beyond, A charge transmitted and gift occult for those being born. 12 Democracy! near at hand to you a throat is now inflating itself and joyfully singing. Ma femme! for the brood beyond us and of us, For those who belong here and those to come, I exultant to be ready for them will now shake out carols stronger and haughtier than have ever yet been heard upon earth. I will make the songs of passion to give them their way, And your songs outlaw'd offenders, for I scan you with kindred eyes, and carry you with me the same as any. I will make the true poem of riches, To earn for the body and the mind whatever adheres and goes forward and is not dropt by death; I will effuse egotism and show it underlying all, and I will be the bard of personality, And I will show of male and female that either is but the equal of the other, And sexual organs and acts! do you concentrate in me, for I am determin'd to tell you with courageous clear voice to prove you illustrious, And I will show that there is no imperfection in the present, and can be none in the future, And I will show that whatever happens to anybody it may be turn'd to beautiful results, And I will show that nothing can happen more beautiful than death, And I will thread a thread through my poems that time and events are compact, And that all the things of the universe are perfect miracles, each as profound as any. I will not make poems with reference to parts, But I will make poems, songs, thoughts, with reference to ensemble, And I will not sing with reference to a day, but with reference to all days, And I will not make a poem nor the least part of a poem but has reference to the soul, Because having look'd at the objects of the universe, I find there is no one nor any particle of one but has reference to the soul. 13 Was somebody asking to see the soul? See, your own shape and countenance, persons, substances, beasts, the trees, the running rivers, the rocks and sands. All hold spiritual joys and afterwards loosen them; How can the real body ever die and be buried? Of your real body and any man's or woman's real body, Item for item it will elude the hands of the corpse-cleaners and pass to fitting spheres, Carrying what has accrued to it from the moment of birth to the moment of death. Not the types set up by the printer return their impression, the meaning, the main concern, Any more than a man's substance and life or a woman's substance and life return in the body and the soul, Indifferently before death and after death. Behold, the body includes and is the meaning, the main concern and includes and is the soul; Whoever you are, how superb and how divine is your body, or any part of it! 14 Whoever you are, to you endless announcements! Daughter of the lands did you wait for your poet? Did you wait for one with a flowing mouth and indicative hand? Toward the male of the States, and toward the female of the States, Exulting words, words to Democracy's lands. Interlink'd, food-yielding lands! Land of coal and iron! land of gold! land of cotton, sugar, rice! Land of wheat, beef, pork! land of wool and hemp! land of the apple and the grape! Land of the pastoral plains, the grass-fields of the world! land of those sweet-air'd interminable plateaus! Land of the herd, the garden, the healthy house of adobie! Lands where the north-west Columbia winds, and where the south-west Colorado winds! Land of the eastern Chesapeake! land of the Delaware! Land of Ontario, Erie, Huron, Michigan! Land of the Old Thirteen! Massachusetts land! land of Vermont and Connecticut! Land of the ocean shores! land of sierras and peaks! Land of boatmen and sailors! fishermen's land! Inextricable lands! the clutch'd together! the passionate ones! The side by side! the elder and younger brothers! the bony-limb'd! The great women's land! the feminine! the experienced sisters and the inexperienced sisters! Far breath'd land! Arctic braced! Mexican breez'd! the diverse! the compact! The Pennsylvanian! the Virginian! the double Carolinian! O all and each well-loved by me! my intrepid nations! O I at any rate include you all with perfect love! I cannot be discharged from you! not from one any sooner than another! O death! O for all that, I am yet of you unseen this hour with irrepressible love, Walking New England, a friend, a traveler, Splashing my bare feet in the edge of the summer ripples on Paumanok's sands, Crossing the prairies, dwelling again in Chicago, dwelling in every town, Observing shows, births, improvements, structures, arts, Listening to orators and oratresses in public halls, Of and through the States as during life, each man and woman my neighbor, The Louisianian, the Georgian, as near to me, and I as near to him and her, The Mississippian and Arkansian yet with me, and I yet with any of them, Yet upon the plains west of the spinal river, yet in my house of adobie, Yet returning eastward, yet in the Seaside State or in Maryland, Yet Kanadian cheerily braving the winter, the snow and ice welcome to me, Yet a true son either of Maine or of the Granite State, or the Narragansett Bay State, or the Empire State, Yet sailing to other shores to annex the same, yet welcoming every new brother, Hereby applying these leaves to the new ones from the hour they unite with the old ones, Coming among the new ones myself to be their companion and equal, coming personally to you now, Enjoining you to acts, characters, spectacles, with me. 15 With me with firm holding, yet haste, haste on. For your life adhere to me, (I may have to be persuaded many times before I consent to give myself really to you, but what of that? Must not Nature be persuaded many times?) No dainty dolce affettuoso I, Bearded, sun-burnt, gray-neck'd, forbidding, I have arrived, To be wrestled with as I pass for the solid prizes of the universe, For such I afford whoever can persevere to win them. 16 On my way a moment I pause, Here for you! and here for America! Still the present I raise aloft, still the future of the States I harbinge glad and sublime, And for the past I pronounce what the air holds of the red aborigines. The red aborigines, Leaving natural breaths, sounds of rain and winds, calls as of birds and animals in the woods, syllabled to us for names, Okonee, Koosa, Ottawa, Monongahela, Sauk, Natchez, Chattahoochee, Kaqueta, Oronoco, Wabash, Miami, Saginaw, Chippewa, Oshkosh, Walla-Walla, Leaving such to the States they melt, they depart, charging the water and the land with names. 17 Expanding and swift, henceforth, Elements, breeds, adjustments, turbulent, quick and audacious, A world primal again, vistas of glory incessant and branching, A new race dominating previous ones and grander far, with new contests, New politics, new literatures and religions, new inventions and arts. These, my voice announcing—I will sleep no more but arise, You oceans that have been calm within me! how I feel you, fathomless, stirring, preparing unprecedented waves and storms. 18 See, steamers steaming through my poems, See, in my poems immigrants continually coming and landing, See, in arriere, the wigwam, the trail, the hunter's hut, the flat-boat, the maize-leaf, the claim, the rude fence, and the backwoods village, See, on the one side the Western Sea and on the other the Eastern Sea, how they advance and retreat upon my poems as upon their own shores, See, pastures and forests in my poems—see, animals wild and tame—see, beyond the Kaw, countless herds of buffalo feeding on short curly grass, See, in my poems, cities, solid, vast, inland, with paved streets, with iron and stone edifices, ceaseless vehicles, and commerce, See, the many-cylinder'd steam printing-press—see, the electric telegraph stretching across the continent, See, through Atlantica's depths pulses American Europe reaching, pulses of Europe duly return'd, See, the strong and quick locomotive as it departs, panting, blowing the steam-whistle, See, ploughmen ploughing farms—see, miners digging mines—see, the numberless factories, See, mechanics busy at their benches with tools—see from among them superior judges, philosophs, Presidents, emerge, drest in working dresses, See, lounging through the shops and fields of the States, me well-belov'd, close-held by day and night, Hear the loud echoes of my songs there—read the hints come at last. 19 O camerado close! O you and me at last, and us two only. O a word to clear one's path ahead endlessly! O something ecstatic and undemonstrable! O music wild! O now I triumph—and you shall also; O hand in hand—O wholesome pleasure—O one more desirer and lover! O to haste firm holding—to haste, haste on with me.